A man stands in a standing in a crop of cassava that is being cultivated using an improved technique in Boukoko, Central African Republic. Education can help increase agricultural productivity: Farm output needs to rise by at least 70% by 2050. Field schools and extension education help farmers increase productivity by 12% and net revenue by 19%. Education can provide skills for green innovation: But sub-Saharan Africa’s share of global expenditure on public agricultural research declined from 10% in 1960 to 6% in 2009. 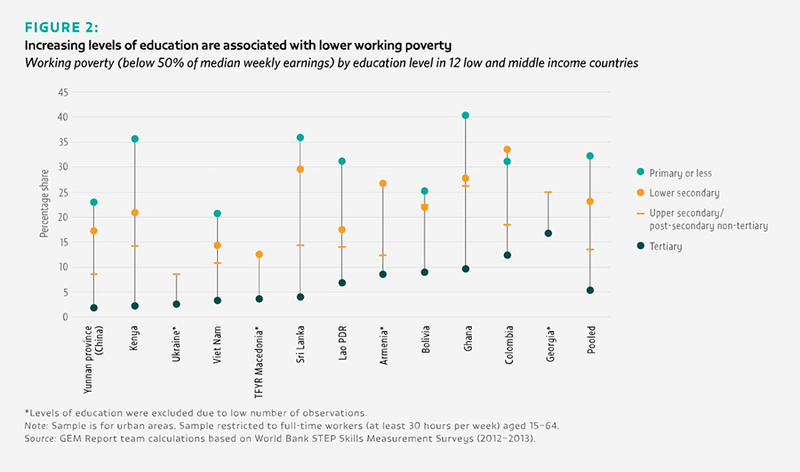 Education reduces working poverty: It affects almost 90% of workers in low income countries. Increasing tertiary education in 10 recent EU member states would reduce numbers at risk of poverty by 3.7 million. Tertiary education is required to sustain and expand high-skills occupations: In 2015, two-thirds of workers were employed in medium skills occupations. Education needs to keep up with labour market needs: By 2020 the world could have 40 million too few workers with tertiary education, relative to demand. The world economy needs to become environmentally sustainable and inclusive if the 2030 Agenda is to succeed. Education has a key role in this transformation. Education and lifelong learning are needed to make production and consumption sustainable, supply skills for the creation of green industry and orient higher education and research towards green innovation. They also have a part to play in transforming key economic sectors, such as agriculture, upon which both rich and poor countries and households rely. Just as the economy must become sustainable, so too must it become more inclusive and less unequal. Education of good quality can contribute to these aims. A better-educated labour force is essential to inclusive economic growth focused on human welfare. Education reduces poverty by increasing chances of finding decent work and adequate earnings, and helps close wage gaps due to gender, socio-economic status and other bases of discrimination. Sustainable development and green growth mean creating green industries and ‘greening’ existing ones. Green industries already employ large numbers of workers, and are expected to grow significantly in lower income countries. For instance, renewable sources may account for almost half the total increase in global electricity generation between 2015 and 2040, with growth especially in China, India, Latin America and Africa. Creating green industries relies on high-skill workers with specific higher education and training; greening existing industries requires continuing education and training for low- and medium-skill workers, often on the job. Policymakers and educators face the challenge of defining which skills to teach, as economies undergo rapid change. Sustainability and green growth require substantial increases in research and development investment. For higher education systems to provide enough people with specialist knowledge and skills in a wide range of fields, diverse and specific curricula are needed, along with cooperative study programmes across fields. The International Energy Agency estimates that governments need to increase energy research and development by up to fivefold annually to achieve a quick transition to low carbon intensity. Agriculture worldwide faces an unprecedented challenge over 2015–2030. It is one of the economic sectors most directly affected by environmental degradation and it is responsible for a third of greenhouse gas emissions. Meanwhile, population growth requires a huge but sustainable increase in food production and more equitable distribution of food supplies. Education is vital for sustainable food production. Primary and secondary education give future farmers foundation skills as well as critical knowledge about sustainability challenges in agriculture. Vocational training and skills policies bridge the gap between farmers and new technology. Literacy and agricultural extension programmes can help farmers increase productivity. Agricultural research connected with tertiary education helps produce innovation leading to increased sustainability. Yet many countries and donors have halted or reduced investment in such research. Notably, the share of sub-Saharan Africa in global expenditure on public agricultural research declined from 10% in 1960 to 6% in 2009. Increased levels of primary and secondary education contribute to long-term economic growth. Initial levels of educational attainment explain about half the difference in growth rates between East Asia and sub-Saharan Africa between 1965 and 2010. Good quality education and highly skilled workers foster productivity gains and technological change. Differences in the quality of education systems help explain the East Asian ‘miracle’ in economic growth and Latin America’s ‘lost decades’. For countries to prosper, investment in good quality secondary and tertiary education is a must. This is particularly true of sub-Saharan Africa, where the gross enrolment ratio in tertiary education was just 8% in 2014. If education is to continue to drive growth, it must keep up with the rapidly changing world of work. Technology has not only raised demand for high-skill workers but has also reduced demand for medium-skill jobs, such as clerical and sales workers and machine operators, whose tasks are more easily automated. This could affect millions in the future: In 2015, slightly less than two-thirds of total employment was in medium-skill occupations. Evidence suggests that most education systems are not keeping up with market demand. By 2020, the world could have 40 million too few workers with tertiary education relative to demand, and up to 95 million too many at lower education levels. Skills and competences promoted by general, comprehensive education – criticalthinking, problem solving, team and project work, and solid literacy, communication and presentation skills – are likely to remain valued in the labour market. Acquiring a range of transferable and foundation skills is therefore extremely important for future employment. The challenge for education systems is how to impart them to students most effectively. Education is essential in ensuring that economic growth is sustainable and does not leave anyone behind. Education drives growth, increases the incomes of the poorest and, if equitably distributed, reduces inequality. If 10 recent European Union (EU) member states meet 2020 targets to cut early school leaving and increase tertiary participation, it could reduce the number of those at risk of poverty by 3.7 million. However, increases in training and skills have not always translated evenly into reduced social inequality. Alongside efforts to equitably expand education, governments need to focus on redistributive social policies to help reverse the trend of widening income inequality within countries. Unemployment rates are lower among the more educated, particularly in richer countries. In the Organisation for Economic Co-operation and Development (OECD), only 55% of adults aged 25 to 64 with less than an upper secondary education were employed in 2013, compared with 73% of those with an upper secondary or non-tertiary education and 83% with a tertiary qualification. In poorer countries, this relationship often weakens among youth, suggesting that the demand for skilled labour is comparatively lower and that education systems are not equipping students with relevant skills. Reducing education disparity can increase access to decent work among disadvantaged groups. Analysis conducted for the 2016 GEM Report suggests that if workers from advantaged and more disadvantaged social backgrounds had the same education, disparity in working poverty could reduce by 39%. Education is clearly linked with earnings – across 139 countries, the rate of return per additional year of schooling is 9.7%. Rates of return are highest in poorer countries that lack skilled workers. However, ensuring that students benefit the most from higher attainment requires that education investments are accompanied by economic policies that increase demand for skilled labour. While green growth offers many opportunities for expanding employment, job losses are inevitable when environmentally unsustainable industries close. Expanded lifelong learning policies are needed to promote education and training programmes enabling displaced workers to shift into new jobs.